A backchannel -- a digital conversation that runs concurrently with a face-to-face activity -- provides students with an outlet to engage in conversation. Every time I think about this tool, I remember my student, Charlie (not his real name). Given his learning challenges, he struggled to keep up during class discussions. Long after his classmates grasped a concept, he would light up in acknowledgement and then become crestfallen as he had no way to share his revelation. Charlie needed an alternative means to participate, and a backchannel would have provided him with that outlet. At the time, we did not have mobile devices. If we had, then a number of free tools could have augmented class discussions and supported students like Charlie. 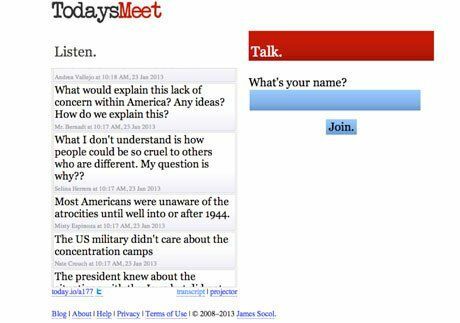 TodaysMeet would have let teachers create private chat rooms so that students could ask questions or leave comments during class. A Padlet wall might have fueled students to share their ideas as text, images, videos, and links posted to a digital bulletin board. The open response questions available in a student response system like Socrative or InfuseLearning could have become discussion prompts to give each student an opportunity to share his or her ideas before engaging in class discussion. Consider the students like Charlie who cannot process at the same pace, the ones unable to speak up over the din of the class, or those who want to share ideas to a point of disruption and need an outlet for their enthusiasm. Backchannels give all of these students a voice. They create a blended environment where teachers and students engage in both physical and online conversations so that learning is no longer confined to a single means of communication or even an arbitrary class period. Backchannels don't replace class discussions -- they extend them. (See Padlet page for full image). From time travel to stem cells, her students unleashed their ideas. Using their digital contributions as a foundation, Rhonda set her students loose on a collaborative research mission to explore their interests. Within the constraints of a traditional learning environment, the students might not have felt the same confidence to express their curiosity or the intrinsic motivation to seek out answers. By providing them with an outlet for their questions, Rhonda created an authentic learning environment to support further scientific exploration. This may seem like an advanced concept, but even the youngest learners can leverage a backchannel to express their ideas. 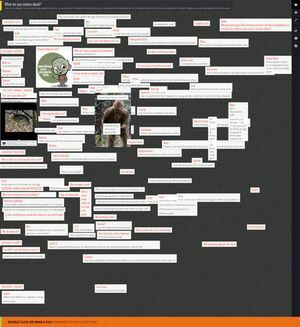 To inspire questioning and wondering, Meghan Zigmond put her first grade students in groups and allowed them to use a Padlet wall to capture their questions as they read Douglas Florian's Comets, Stars, The Moon, and Mars: Space Poems and Paintings. Normally, Meghan found that only a few of her students might have a chance to share their ideas, and these thoughts might be lost at the end of class. However, by incorporating a backchannel, all of her students could contribute their questions both in their small groups as well as to the entire class. With the inquiries documented, Meghan could then let the students drive their scientific investigations for a unit on objects in the sky. During a parent presentation on Google Glass, Terri Eichholz (@terrieichholz) discovered that by using mobile devices and a backchannel during presentations or lectures, her students actually paid closer attention to the speaker. She used Socrative to capture her fifth graders' questions and answers throughout the presentation, giving them an immediate channel for their thoughts. Throughout the presentation, they could pause their physical conversation to incorporate the digital one. In doing this, Terri observed that her students seemed genuinely interested in developing good contributions and were less likely to interrupt the speaker to express them. At the end of the day, she had an archive of all that had been discussed and encouraged each of her students to have a meaningful voice. How many students participate in a class discussion? A handful? Five to ten? . . . to get all students to have a voice is every teacher's challenge. 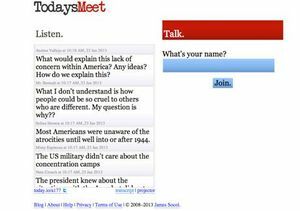 To meet this challenge, Jeff Bernadt (@jbernadt) integrated TodaysMeet into his high school history class. As each student read a different article, he or she contributed reflections to a backchannel. A face-to-face conversation while simultaneously reading might have been a distraction. However, by typing their thoughts, all students contributed their ideas while each having the autonomy to work at his or her own pace. In a traditional class, the vocal few might have dominated the discussion. The backchannel gave every student an opportunity to express his or her views and to listen to voices that otherwise may not have been heard. It was instant-amazing. All you could hear were the keys clicking. And best of all, the conversations were never lost. You could read them all. It can be difficult to collect every student's ideas solely in a face-to-face setting. Vocal students might dominate the conversation before more reticent ones can contribute. Younger students may be more eager to share their thinking, while older ones might hesitate because of social pressures. A backchannel creates ubiquitous opportunities. In a blended environment, students and teachers can communicate through multiple modalities, allow their thoughts to develop over time, and engage in authentic learning. 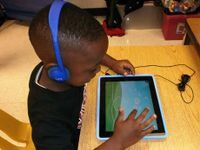 Across the curriculum, backchannels lead to better outcomes as learning no longer becomes confined to a desk, or a room, or even the school day.